An iPhone can function as a video camera (video recording was not a standard feature until the iPhone 3GS was released), a camera phone, a portable media player, and an Internet client with email and web browsing capabilities, can send texts and receive visual voicemail, and has both Wi-Fi and 3G connectivity. Third-party as well as Apple application software is available from the App Store, which launched in mid-2008 and now has over 425,000″apps” approved by Apple. These apps have diverse functions, including games, reference, GPS navigation, social networking, security and advertising for television shows, films, and celebrities. There are four generations of IPhone models, each accompanied by one of the four major releases of iOS (formerly iPhone OS). The original iPhone was a GSM phone that established design precedents like screen size and button placement that have persisted through all models. The iPhone 3G added 3G cellular network capabilities and A-GPS location. The iPhone 3GS added a compass, faster processor, and higher resolution camera, including video recording at 480p. The iPhone 4 has a rear facing camera (720p video) and a front facing camera (at a lower resolution) for FaceTime video calling and for use in other apps like Skype. The back of the original iPhone was made of aluminum with a black plastic accent. The iPhone 3G and 3GS feature a full plastic back to increase the strength of the GSM signal. 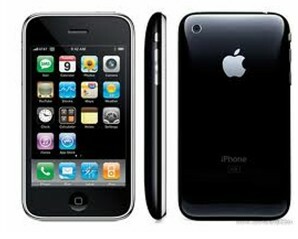 The iPhone 3G was available in an 8 GB black model, or a black or white option for the 16 GB model. They both are now discontinued. The iPhone 3GS was available in both colors, regardless of storage capacity. The white model was discontinued in favor of a black 8 GB low-end model. The iPhone 4 has an aluminosilicate glass front and back with a stainless steel edge that serves as the antennas. It was at first available in black; the white version was announced, but not released until April 2011, 10 months later. All iPhone models include written documentation, and a dock connector to USB cable. The original and 3G iPhones also came with a cleaning cloth. The original iPhone included stereo headset (earbuds and a microphone) and a plastic dock to hold the unit upright while charging and syncing. The iPhone 3G includes a similar headset plus a SIM eject tool (the original model requires a paperclip). The iPhone 3GS includes the SIM eject tool and a revised headset, which adds volume buttons (not functional with previous iPhone versions). The iPhone 3G and 3GS are compatible with the same dock, sold separately, but not the original model’s dock. All versions include a USB power adapter, or “wall charger,” which allows the iPhone to charge from an AC outlet. The iPhone 3G and iPhone 3GS sold in North America, Japan, Colombia, Ecuador, or Peru include an ultra compact USB power adapter.